This year try some of these Holiday Hacks to help your festivities be less stressful and more joyful! For many of us, the holiday season (Thanksgiving through the New Year) involves endless lists of things to do, calendars bursting with events, and feelings of overwhelm. With all that and more the holidays lend themselves to being stressful, but it doesn’t have to be that way. Get your menu set weeks in advance. 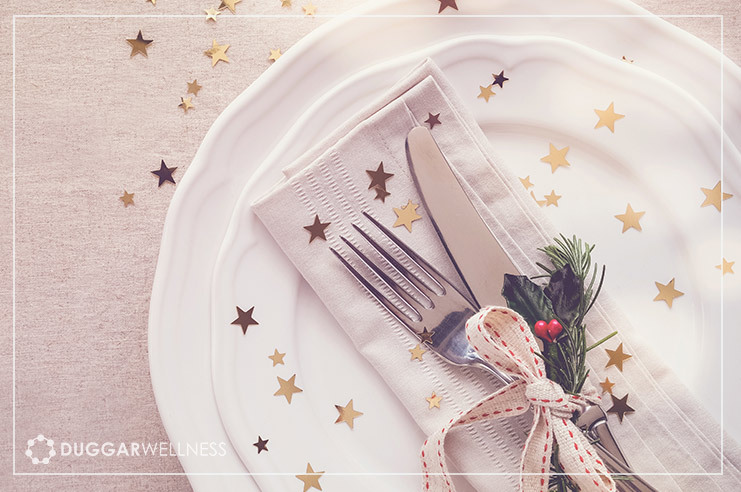 (check out my Christmas meal plan) Many patients in our office have some strict dietary restrictions, take that into account when you plan a menu and ask your guest if they have any special dietary needs. As someone who has some special dietary needs, I am always willing to bring a dish to a gathering that I know I can eat, and I always make accommodations for guest that will be coming to our home. If you’re having a large gathering with people who may have various dietary restrictions, make it a pot-luck gathering. To avoid an unbalanced buffet of food, assign a specific type of dish to each guest. Appetizer Dishes: bean or veggie based dips to serve with veggies or crackers, salsa and tortilla chips or even fruit dip. One of our favorite appetizers is a charcuterie board (thats a fancy name for a fancy spread of cured meats that usually has cheese, crackers, a little fruit and probably other savory items like pickles, artichoke hearts, roasted peppers and olives.) You can find some great ideas for (shahr-cute-uh-ree) boards on pinterest, like this one. Salad Dishes: These can be a simple green salad, a potato salad, a salad without lettuce or a salad packed with all sorts of goodness. For more salad ideas visit the salad recipes section of our site. Side Dishes: These could include soups or veggies or grain dishes, find some ideas here. Main Dish: As the host I find it generous to prepare the main dish. This could be a roasted turkey, chicken wings, baked fish, Stir-Fry or even a hearty soup or chili. Letting your guest know what the main course will be can help them decide what they should bring as their luck item. Remember gatherings don’t have to always include a full meal. You can also just serve appetizers, finger foods or a dessert buffet. Let go of doing everything yourself. As mentioned above, share the meal prep by making some food assignments. Delegate non-food item essentials too, have someone be responsible for paper-goods and table cloths, you can even have your “decorator” friend come get the table set all pretty. Add name cards if you are having a smaller gathering, you can even include a small gift for each guest. These special touches make your guests feel special. Eating might be the main even at a holiday gathering but having some planned activities can add extra fun to a party. Delegate these planned activities to the guest that seems to always be the life of the party. Some fun ideas could include; a white elephant exchange, group games like charades or pictionary, a sleigh ride and caroling, story telling of your favorite holiday event, or even a service project like assembling hygiene kits to deliver to a local shelter. Relax. Any gathering should be fun for everyone, including the host. Focus less on trying to impress and more on being engaged. Spending time together, sharing acts of kindness or just enjoying a conversation have more value than a perfect meal, decorations or spotless house and an exhausted host due to all the pre-party preparations. When it comes down to your holiday event your guest will remember more how they felt than even what they ate or how amazing the house looked. What are some of your simple holiday entertaining ideas?